We are so excited to be starting company auditions for the 2017-2018 season!! If you are trying out for an ADP team,you will ONLY attend from 6:30-8:30 p.m. each night. Audition forms and team requirements will be available for review at the clinics. ADP team should also bring ballet and hip hop shoes. DAY 1: Dancers will begin with across the floor work and then learn the audition combo together in groups. DAY 2: Dancers will review the combo and then audition in small groups of 3-4. Call backs are common to have the panel observe the dancers in different groupings. Please be sure your e-mail is printed legibly on the audition form and indicate which Studio you are planning to attend. Team placement notifications will be e-mailed after all final auditions are complete. Parking is available behind the Brigham Studio in the lot north of America's First Credit Union (on the corner of 100 South and 100 East). Access the lot from 100 East. The back entrance to the Studio slopes down next to Fowler's Office Supply. Reminder - we are offering ADP opportunities at the Brigham Studio for Junior and Elite aged dancers!! If we have enough dancers for a Junior ADP team, Juniors will dance two days per week at the Brigham Studio. 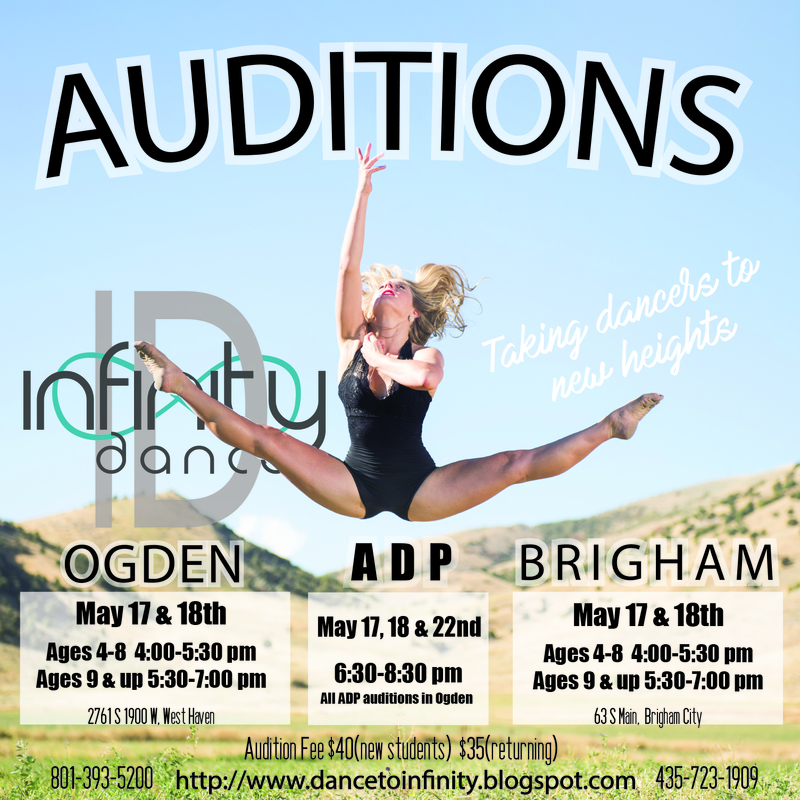 Brigham Elite ADP will dance two days per week in Brigham and one day per week in Ogden, doing 1-2 combined routines with Ogden Elite ADP. We hope dancers ready to take it to the next level will take advantage of these opportunities!! Junior ADP aged dancers will have one additional day added at the Ogden Studio. Ellie, Karson and Kenzie are looking for dancers for some combined and auditioned routines in Brigham and dancers ready to move up to a Senior IDC team at the Brigham Studio. JeriAnn will again be offering a Junior ITC Comp Class at both the Brigham and Ogden Studios. Dancers with 1-2 years of experience and interest in an additional technique class and one competition can contact the office to be added to the list. Classes will begin in the fall. 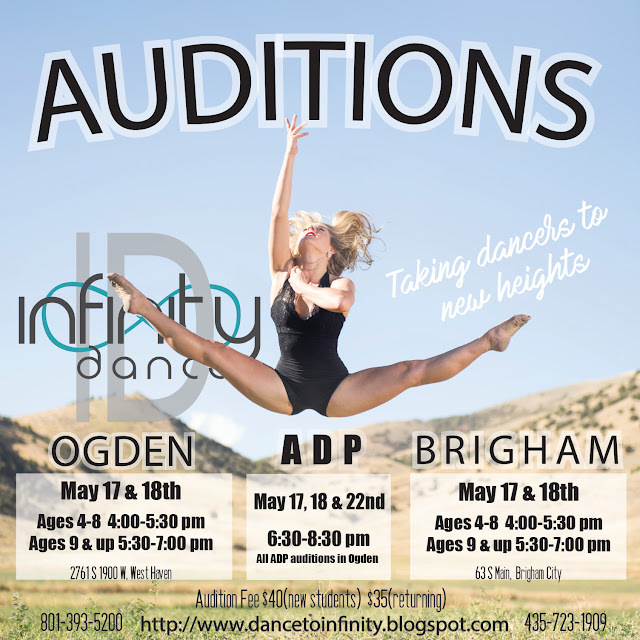 The Full Out one-day dance intensive is scheduled for June 23 in Ogden. All dancers auditioning for an IPC, IDC, or ADP team should plan to attend.